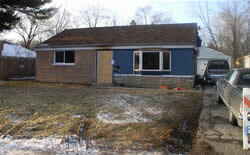 HomeLatest NewsInvestigation Continues: Reported Arson/Suicide on Monee Rd. Park Forest, IL–(ENEWSPF)– Police continue to investigate a fire that broke out in the early morning of January 19 left one man dead. Park Forest police released a statement calling the incident a possible arson/suicide. Shortly after 1:30 in the morning, police were investigating a report of gun shots in the area of Monee and Western. Investigating patrol units observed that the single family home located at 8 Monee Rd. was engulfed in flames. Park Forest Fire Department units responded and suppressed the house fire. A deceased male white body was located in the living room immediately inside the front door. The Park Forest P.D. Arson Investigation Unit responded and found evidence of accelerants at three separate points of origin throughout the house. The fire does not appear to be accidental. The State of Illinois Fire Marshall's Office and the Cook County Sheriff's Police Department Crime Scene Unit responded at the request of PFPD Detectives. Director of Building, Planning, Zoning & Community Development Larrie Kerestes reported to the village board Saturday that the house will probably have to be demolished, but that determination will be made after the Fire Department has issued its final report. He indicated that it may be some time before the house is torn down. "We will push it through until we get a resolution," he said, "This hasn't even started the court process." As of this writing, the Park Forest Police Department has not yet issued a final report.